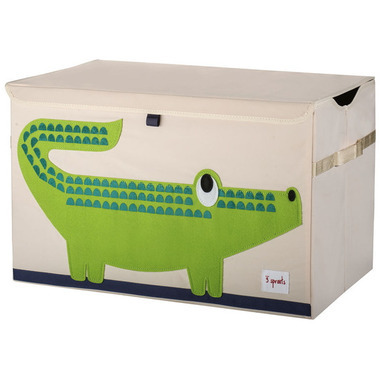 The 3 Sprouts toy chest is the perfect organizational tool for any room. With sides reinforced by cardboard this toy chest stands at attention even when empty and the lid keeps all toys out of sight. Large enough to hold whatever you throw in it, this toy chest adds a pop of fun to every room. The 3 Sprouts Toy Chest makes organizing a room full of toys easy! The perfect size. Easy for my toddlers to get stuff in and out of it. Super cute! Easy to assemble! Lightweight if you want to move it around! Love their storage products! Great storage for items in our playground and the kids love it too! Love this storage bin. Love that the lid closes so the toys can't be seen once they are away. Lid is NOT sturdy enough for climbing on, but I actually like that feature because I don't want to encourage climbing on the toy box anyways. I purchased this as a Christmas gift for my grandson/daughter-in-law and both were very pleased. The chest is easy for my grandson to open and close, and my daughter-in-law loves the cute and tidy storage place for his toys. I am very pleased with this purchase. Perfect size! My 1 year old loves to open and close it and rummage around - and it fits a ton of toys. This is the second one I purchased. Great for toy storage at the end of the day and shallow enough for my ten month old to reach in and pull out toys himself. Super cute and a great size. We bought two to hold our one year old's toys. She's a little too short to reach the bottom but we put some folded towels under the toys so she can reach everything. This toy chest has a ton of space! It's easy open lid is great for little hands! We have three of these now in different designs... Love them! Not the most sturdy, but for the price they are great value! We have one for stuffed animals, one for blankies, and one for dress up outfits. The kids like that they can clean up all by themselves, I like the nice clean look with the items hidden under lids & there is no heavy lid to fall on them like some wooden toy chests / boxes. Perfect hiding place for toys, lots of room for everything! My little girl loves lifting the lid and finding something new, emptying it is a fun activity in itself.